Designed by the talented Andrea Mowry, the fabulous Shift Cowl cleverly uses slipped stitches and contrasting colored yarn to create an accessory you will want to wear every day. 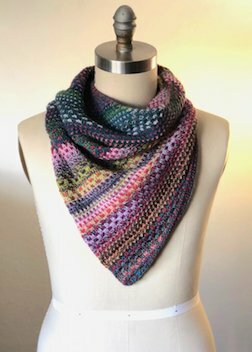 In this Shift Cowl class you will learn to knit on the bias working with multiple colors of yarn, mosaic knitting, create an I-cord edging, and learn finishing techniques, so that you end up with a finished cowl you will love wearing. Just one warning, these cowls are addictive, and after this class you might end up making more than one! Come join the fun! Tuition of $45 includes: One 3-hour class session, The Shift pattern, and a one-time 10% odiscount coupon for in-store merchandise (excludes classes).